Without the restrictions of war, designs were to be focused on new materials and construction techniques for these so-called “contemporary dwelling units”. 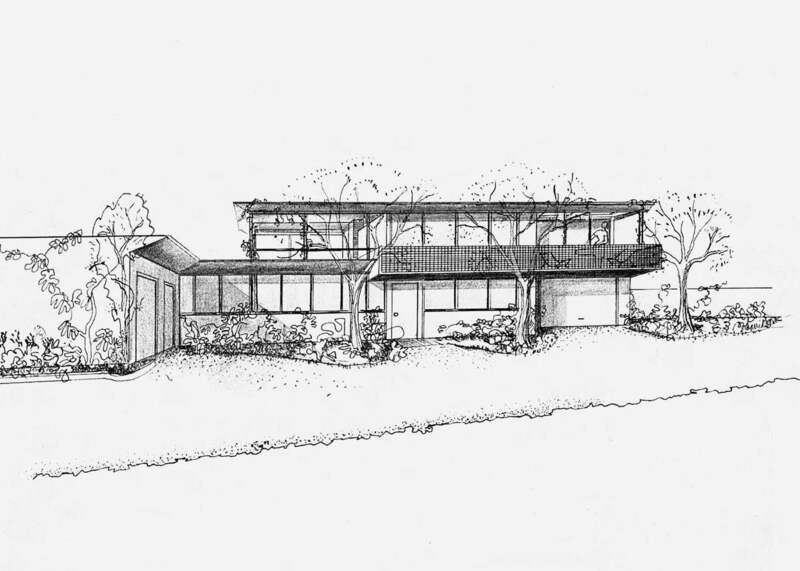 Though not all the houses were built, the program spanned from 1945-1966, and included 36 designs located mainly in the Southern California area. With the intent to be accessible for the average family, the houses were designated a budget (subject to price fluctuation), and had to be easily duplicated. 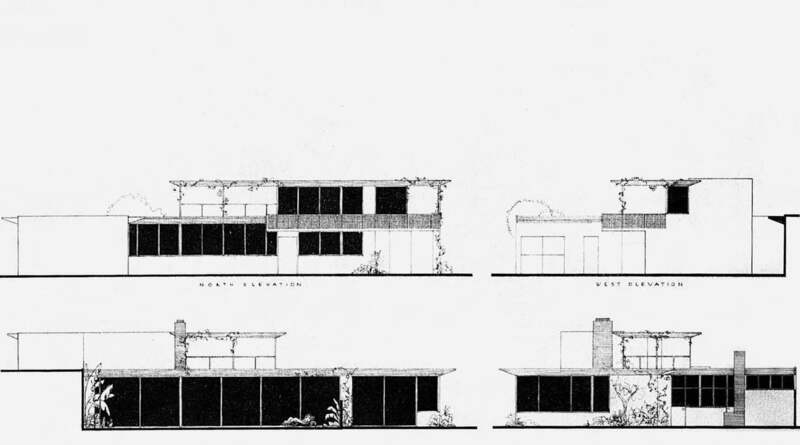 The plans for Case Study House #1 were announced in the 1945 February/March issue, with architect Julius Ralph (J.R.) Davidson providing a possible living solution for a busy “Mr. and Mrs. X” with a growingly independent daughter and frequently visiting mother-in-law. Davidson proposed that their optimal living environment would be solved with the key elements of efficiency, privacy and separation, inside-outside living, and ample areas for both storage and entertainment. Placing the two-story house diagonally across the lot allowed maximum sun exposure and helped to determine the long rectangular shape. To increase space and efficiency for Mr. and Mrs. X, Davidson utilized many built-in features, not just for storage but also for lighting, electronics, and even a piano! A fun detail was an in-home “silver-screen” for movie viewing that slips behind the piano when not in use. While the first version was never built, a “restudy and new solution” for Case Study House #1—though this time it was technically ninth in the series—was presented in the 1948 May issue and completed that year. Still standing today in the Toluca Lake neighborhood of North Hollywood, California, the 2,000-square foot house follows certain themes from the 1945 model including the open floor plan conducive to indoor-outdoor living, and the many built-in features. The diagonal placement to maximize sun exposure was kept, however the final design was only one story. To utilize those California sun rays, floor to ceiling sliding glass doors were used throughout the house and casement clerestory windows were put in the bathrooms. Also echoed in both plans are minimum maintenance, the abundance of light and air, and privacy. Still under one roof, the guest quarters are separated by an outdoor passage and eating area to achieve the feel of a separate living space. Sectioned off from the main garden by a high fence, a private garden area is located just outside the master aedroom for maximum privacy. “The structure is standard wood frame on a reinforced foundation with water-proofed reinforced concrete slab floor. Exterior is of the new aluminum siding,” the original 1948 publication states. The flooring somewhat mimics the 1945 plan with carpeting used in the living areas and bedrooms while asphalt tile covers the bathrooms, laundry, and kitchen areas. Other special features were the use of “all-gas” equipment and the utilization of Formica to cover working surfaces throughout the house. For more on Case Study House #1, visit artsandarchitecture.com or laconservancy.org.